Stephen Hawking’s A Brief History of Time was a publishing phenomenon. Translated into thirty languages, it has sold over nine million copies worldwide. It continues to captivate and inspire new readers every year. When it was first published in 1988 the ideas discussed in it were at the cutting edge of what was then known about the universe. In the intervening years there have been extraordinary advances in our understanding of the space and time. The technology for observing the micro- and macro-cosmic world has developed in leaps and bounds. During the same period cosmology and the theoretical sciences have entered a new golden age. Professor Stephen Hawking has been at the heart of this new scientific renaissance. 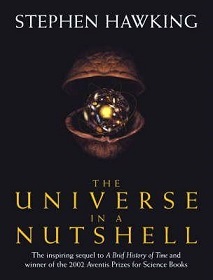 Now, in The Universe in a Nutshell, Stephen Hawking brings us fully up-to-date with the advances in scientific thinking. We are now nearer than we have ever been to a full understanding of the universe. In a fascinating and accessible discussion that ranges from quantum mechanics, to time travel, black holes to uncertainty theory, to the search for science’s Holy Grail – the unified field theory (or in layman’s terms the ‘theory of absolutely everything’) Professor Hawking once more takes us to the cutting edge of modern thinking. Beautifully illustrated throughout, with original artwork commissioned for this project, The Universe in a Nutshell is guaranteed to be the biggest science book of 2001.